“Life is like a camera FOCUS on what’s important and you’ll capture it perfectly”. Learn how to keep the “main thing the main thing” and stay focused! In this episode, I share a few tips on how to stay focused. By making a To-Do-List, eliminating distractions and adjusting your daily routine can tremendously improve your focus. Staying focused is a skill that’s really simple to explain: you concentrate your mind on a single thing and don’t allow it to be disturbed by anything else. However, it’s easier said than done but it’s not impossible; it just requires practice and commitment. 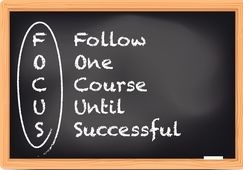 F.O.C.U.S- Follow One Course Until Successful. Ready to go from Ordinary to Legendary?